Gilbert Pidcock (1743-1810) made his name as the owner of a small travelling menagerie, but in 1793 bought the stock of Thomas Clark, a dealer in wild birds and animals who had the lease of Exeter 'Change and the Lyceum Theatre in London. Pidcock kept his animals there but toured them to London fairs and the provinces during the summer. Pidcock's menagerie at Exeter 'Change was an exhibition hall in London's Strand. The menagerie was divided into three rooms and included African lions, tigers, beavers, emus and ostriches. According to the Morning Chronicle in 1808, the animals could be viewed for a shilling a room, or all three rooms for two shillings and sixpence. Gilbert Pidcock died in 1810 aged 67, and was succeeded by Polito and then Cross. All the animals were removed to the Surrey Zoological Gardens in about 1828, after which Exeter 'Change was demolished. 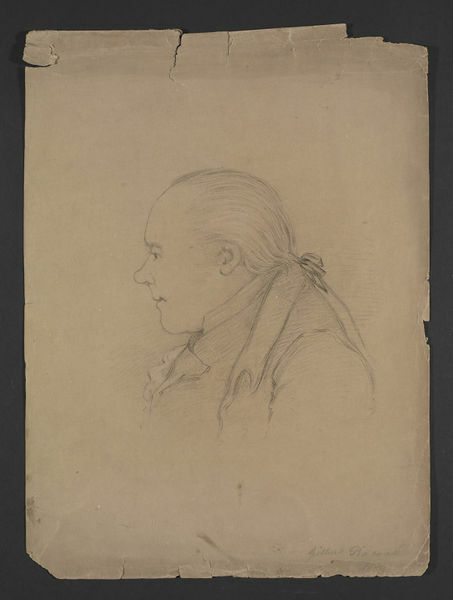 Pencil sketch, head and shoulders profile, of Gilbert Pidcock (1743-1810). 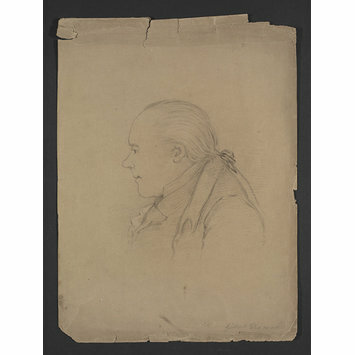 Pidcock is shown facing the viewer's left, his long hair gathered into a simple ribbon, a neckcloth visible at the centre front of his acket, which has wide lapels and a small upright collar. The initials ''G.B.B.' and the date (possibly 1799) are written, faintly, beneath the lapel. Head and shoulders profile pencil sketch of Gilbert Pidcock (1743-1810), owner of Pidock's Menagerie. Indistinct date, possibly 1799, artist unknown.